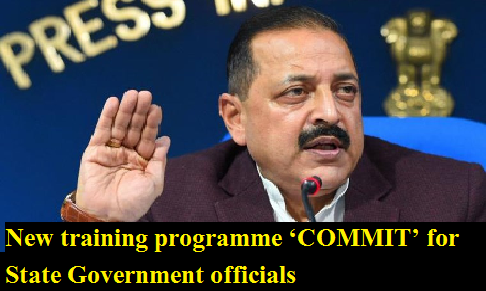 Dr Jitendra Singh launches new training programme ‘COMMIT’ for State Government officials. The objective of this training programme is to improve the public service delivery mechanism and provide citizen centric administration through capacity building of officials who interact with the citizens on day-to-day basis. The Minister of State for Development of North Eastern Region (I/C), Prime Minister’s Office, Personnel, Public Grievances & Pensions, Atomic Energy and Space, Dr. Jitendra Singh launched a new training programme Comprehensive Online Modified Modules on Induction Training (COMMIT) for State Government officials, here today. The objective of this training programme is to improve the public service delivery mechanism and provide citizen centric administration through capacity building of officials who interact with the citizens on day-to-day basis. Speaking on the occasion, Dr. Jitendra Singh said that the new training programme will supplement the earlier training programme and the advantage of COMMIT is that it is cost effective and has the potential to cover about 3.3 lakh officials annually, compared to 10,000 officials under existing 12-Day Induction Training Programme (ITP). The Minister said that citizens can be easily accessible when we go digital. He said that to achieve maximum Governance, it is necessary to equip the officials with the best possible tools to perform best to their ability. Secretary, DoPT, Shri B P Sharma said that COMMIT will be launched in 6 States of Assam, Haryana, Maharashtra, Tamil Nadu, Telangana and West Bengal initially on pilot basis during the current financial year 2017-18 and within next year it is expected to cover all India level. He said that the COMMIT has been designed in such a way that it allows to translate the content in local/regional languages. Representatives from UNDP and senior officers from DoPT were also present during the occasion.